"Totally Dublin" Magazine - Review of 'Long way Home' and Gig at JJ Smyths - Tom Cahill | May issue 2016. Once in a while you have to go away and come back later to get proper attention Greg Lloyd did some gigs around Dublin a while back, then he slipped away and did 50 plus sellout performances all around Australia and Japan. The Long Way Home deserves a good listen to by those who missed it the first time. An astonishing jazz pianist, Lloyd is ably assisted here by drummer Kevin Brady and bassist Dave Redmond. Come for the title track and stay for Uzak and One Night in Samois. Expert improvising musicians can instantly strike a rapport and create good and sometimes great music without having ever previously worked together or even met. 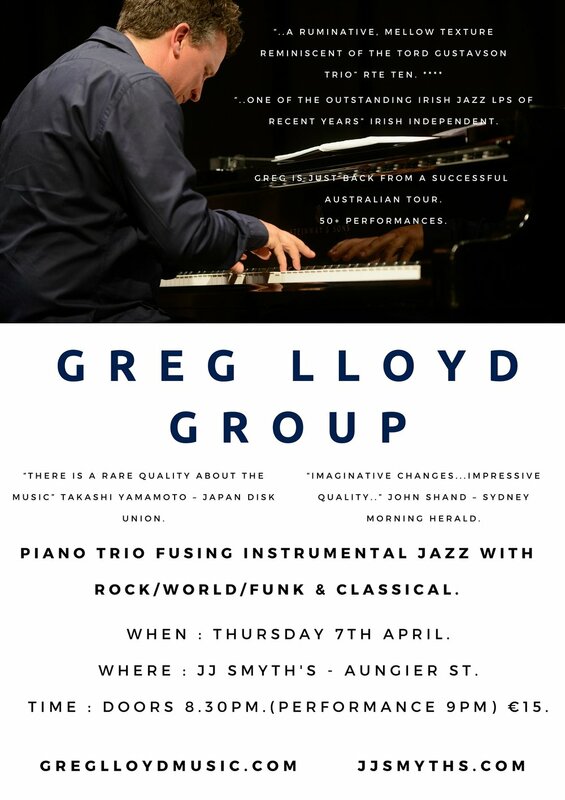 This was the case with pianist Greg Lloyd, an ex-Sydneysider long resident in Ireland, who was playing with the established local rhythm section of bassist Dave Groves and drummer Cameron Reid for the first time. A delight in the music made went hand-in-hand with a fascination in the mechanics of the process. Rather than playing safe with the shared language of standards Lloyd bit the bullet and asked his new colleagues to navigate his own compositions, with one eye on the notation, another on his cues, and their ears working overtime to turn templates into music. The downsides were a certain tentativeness that could hold the music back, and occasional moments of imprecision that more familiarity would have swiftly dispelled. But these drawbacks were far outweighed by the routine convergence of three minds on synonymous ideas in a given moment in time. The impressive quality of Lloyd’s compositions helped the cause. These included the odd mix of portentousness and serenity in Long Way Home, the gospel funk (with rhythmic speed-humps) of Chew the Fat, the vibrant Latin groove of Rue de Seine and, best of all, the exquisite soft-edged impressionism of A Night Away. Singer Susan Gai Dowling joined the trio for four standards in the middle of the performance, and it was a joy to encounter once again the easy flair with which she breathed vitality into a song. The highlight was I Don’t Want to Cry Anymore, a ballad that Dowling could make poignant without wallowing in its sadness. Here, as on his own material, Lloyd impressed with his ability to invest his solos with imaginative changes of rhythmic and melodic direction. The only disappointment was the absence of any of the North African Chaabi music that has been prominent in his European career. Perhaps he needed longer-term collaborators for that. From playing with charades with Beyonce and Jay Z to performing with traditional Algerian musicians is admittedly a stretch, but Barney McAll and Greg Lloyd headed overseas with the same idea: to expand their horizons. McAll went to New York and Lloyd to Paris, neither jazz pianist knowing what would happen next. Now both are back having achieved more than they could have dreamed of. McAll was already among Australia's leading pianists when he moved in 1997, having been visiting New York regularly since 1989. The catalyst was an Australian tour with the acclaimed ex-Miles Davis saxophonist Gary Bartz. Barney McCall ... has collaborated with Sia Furler. "We got on so well that he asked me to join his band," McAll says. Suddenly what was going to be another visit became a permanent stay, although McAll went with no expectations. "I just wanted to learn," he says, "and be in a place where people were very, very serious." He soon found himself working not only with Bartz, but also with such notables as the Groove Collective and Dewey Redman, and international touring became routine amid the New York gigs and recording. Greg Lloyd ... back in Australia for a 50-date tour. One non-jazz collaboration was with Sia Furler, whom McAll had known in Australia. "She used to come to my gigs," he recalls, "and one time she said, 'One day I'm going to be very famous and you are going to play keyboards for me.'" Sure enough it happened (which was how he found himself playing charades with Beyonce and Jay Z), and McAll even became her musical director until recently. His return to Sydney results from winning the 2015 Peggy Glanville-Hicks Composers' Trust Fellowship. "I applied because I wanted to have some time to go in a bit deeper on what I do," he explains, "and it just felt like I was getting swept away by things I didn't want to do in New York." The fellowship provides a home, piano, stipend and the luxury of what Glanville-Hicks considered necessities for mid-career composers: silence and leisure. Meanwhile McAll is about to air the first pieces he has written under the fellowship with his all-star Australian Symbiotic Improvisers Orbit (ASIO). Unlike McAll Greg Lloyd's career had barely begun when he headed overseas with a music degree. "I went to Paris because I was in love with a Parisian at the time," he says. "But things didn't work out, and then I just fell in love with Europe." Having moved to Ireland he found himself playing musical director on El Gusto, an Irish/French/Algerian documentary about the Chaabi music of North Africa. A kind of Algerian Buena Vista Social Club, this included living in Algiers and collaborating with rock-star Damon Albarn of Blur. "I was this young guy standing out the front of 46 musicians," Lloyd recounts, "the youngest of whom was 60." Adding to the challenge Lloyd had to communicate with the players via a translator. But ultimately he says that the film-making and subsequent European touring, "gave me a lot more confidence in my musical knowledge". Returning to Ireland he recorded his first album, A Long Way Home, which interwove a Chaabi influence. Now he is in Australia for a 50-date tour. "I'm happy I've gone to Europe," he says, "because I've learned stuff I don't think I would have learned if I'd stayed here, like the whole El Gusto experience." His trio performances with guest singer Susan Gai Dowling will be the first under his own name in Sydney for 16 years. Greg Lloyd Group: Foundry 616, August 19; Colbourne Ave, September 3. Greg Lloyd is a jazz virtuoso but also a music anthropologist. An Australian based in Ireland, he has pursued his muse around the world, recording across Europe and Africa, where he helped assemble the soundtrack for what has been described as the Algerian version of Buena Vista Social Club. This led to a collaboration with Blur/Gorillaz leader Damon Albarn, a fellow champion of African music who, like Lloyd, appreciates the difference between advocacy and condescension. Those with a vague understanding of jazz tend to assume the genre has atrophied in recent decades, becoming a glorified museum piece. Certainly there are players for whom fealty to the past acts as a straightjacket in the present. Still, that is only an element of the picture and musicians such as Lloyd have a very different outlook. They keep moving – seeing the status quo as existing to be challenged, an apple-cart and it's their duty to upend it. For his latest project Lloyd has embraced the more traditional piano jazz trio. It allows him showcase both his technical mastery – his fingers truly do dance over the keys – and his skills as interpreter. Stooped low, eyes half shut, he steps lightly through his repertoire, pushing the set forward without sounding in a hurry. As with previous undertakings he is eager for his influences to shine. So while the arrangement is 'conventional' piano jazz, Lloyd incorporates his passion for Cuban music. This lends a distinctive sinuousness: there's a looseness, a sense things could twist and buck in an unexpected direction at any moment (as frequently proves the case). The concert is in the NCH's intimate John Field Room, a venue that adds to the charm of the evening. Lloyd is backed by Kevin Brady on drums and Dave Redmond on bass, the ensemble nimble but never showy. Lloyd is too modest to consciously dominate the spotlight and yet it's his piano playing that occupies the foreground – whatever else is happening, it's his transcendental riffing that compels the performance onwards. Some of the pieces are so fresh they don't have names yet (Lloyd's not quite sure whether the opening number has been given a title). Several are taken from his latest album, 'Long Way Home', praised as one of the outstanding Irish jazz LPs of recent years. What they all share is a blend of formal sophistication and earthy lack of pretension. Lloyd's greatest talent is for delivering extraordinary music in a thoroughly unassuming fashion. New release from an Ireland-based piano trio that is influenced by all sorts of music such as Irish, Moroccan, Algerian, Cuban and Jewish. This is a recommended disc (CD) from an Irish-Australian pianist and it sounds exceptionally good. The jacket sleeve is subtle and there is a rare quality about the music. "Lloyd's Right at Home with Rhythm"
Greg Lloyd (piano), Dave Redmond (bass), Kevin Brady (drums), Eddie McGinn (percussion). Australian-born Greg Lloyd, now based in Ireland, has travelled the world soaking up musical influences. The result is an irresistible sense of rhythm, heard especially in a lilting medley by El Anka, a composer of Chaabi music from Algeria. The two tunes of the medley, Soubane Allah Yalatif/Hamdou Lil Allah Mabkash Istiaamar Fi Bledna are tremendously catchy and guaranteed to set hips swaying. The same can be said for the ever-popular Besame Mucho, by the Mexican songwriter Consuelo Velazquez. These and Lloyd's own compositions get great support from bass, drums and percussion. The quartet will play in JJ Smyth's on April 22. "Wistful intuition and a small is beautiful approach make for a striking debut from Irish-Australian Jazz pianist Greg Lloyd." Irish-Australian pianist Greg Lloyd divides his time between Ireland, where he has kept a base for the past 11 years, and regular periods in New York. His very fine debut album draws on a range of diverse influences, with a distinct Latin feel throughout. Eddie McGinn's percussion on a lengthily-titled Algerian Chaabi sequence remains understated and nothing goes into overdrive on this most subtle of records. That latter track may be Algerian but the listener will discern in Lloyd's treatment a certain Flamenco touch, which music owes so much to North Africa anyway. There you have your Latin theme once again, in a roundabout way, as it were. The opener, Uzak, is a Lloyd-penned exercise a la Cubana. It is a tribute to the pianist that he can make something original and authentically salsa, at least to these untutored ears. Extending the Latin tendency, he does a short cover version of the South American standard Bésame Mucho, which is kind of gone before you have noticed. Lloyd's intuitive title track, Long Way Home has a ruminative, mellow texture, winding around a repetitive trope, somewhat reminiscent of the Tord Gustavson Trio. Lloyd and his cohorts (Kevin Brady on drums and double bassist Dave Redmond) conjure a pale, wistful mood. Chew The Fat races on energetically, talking to itself in a sort of blues shuffle. Then comes the sun-dappled, dreamy Danny. The vigorous, up-tempo Rue de Seine sees Brady giving the drums relatively more welly than on the rest of record. But he still doesn't sound remotely like John Bonham. This excellent debut repays repeated listenings and, if there is any justice, should bring Lloyd to a global jazz audience. Thanks for signing up! You can unsubscribe at any time.